LEGAL NOTICE: You're granted the license to freely use Perfgraph. You may not redistribute, sell or re-sell it. Anything else you do with it is at your sole responsibility. The creator or publisher cannot be held liable for any damages, direct or indirect, that result from the use of this software. By running the software you agree to be bound by these terms. Thanks to Franck Delattre of CPU-Z fame for the excellent CPUID SDK. Perfgraph uses the cpuidsdk.dll component from the System Monitoring Development Kit to acquire hardware sensor data. 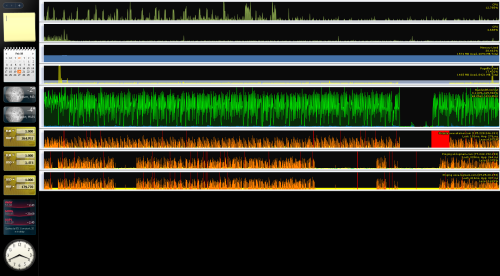 Perfgraph is a CPU / memory / network / hardware monitor. It is implemented as an Explorer toolbar so it does not necessarily take up space from your desktop. 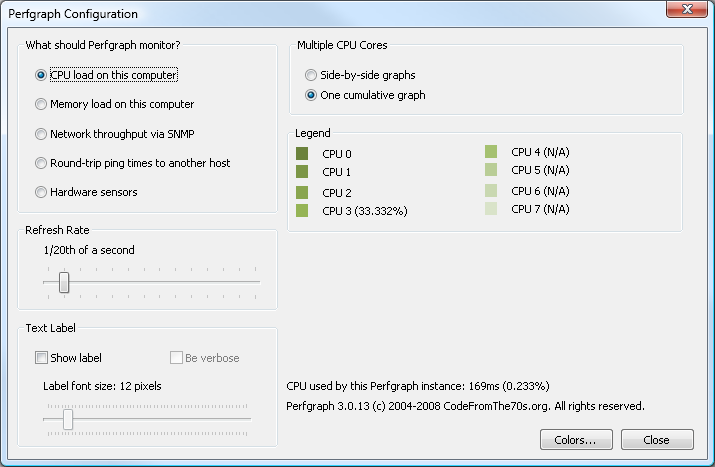 Perfgraph will run on both x86 and x64 versions of Windows XP or later. 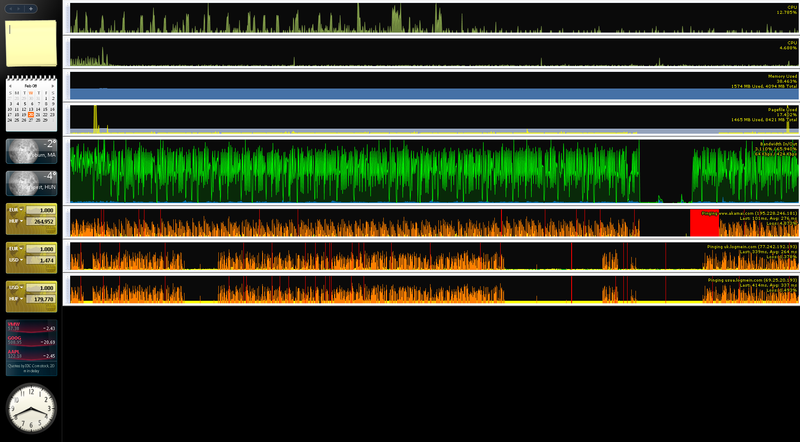 Perfgraph on a laptop, showing CPU and HDD temperature as well as other counters. Run the setup file contained within the zip archive. After installation, a default Perfgraph monitor should appear on your taskbar. 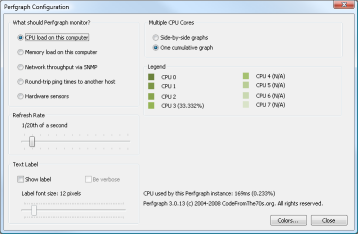 You can summon more Perfgraph monitors by right-clicking your taskbar and selecting "Perfgraph" from the "Toolbars" submenu, or by right-clicking an existing Perfgraph item and selecting "New Perfgraph Instance". To uninstall Perfgraph, use the Add/Remove Programs (XP) or Programs and Features (Vista) control panel applet. Don't forget to close the Perfgraph toolbar before you do so. If you are upgrading from an earlier release you should close Explorer after you start the setup program to avoid having to reboot. This can be done in Windows XP by choosing Turn Off Computer in the Start menu, then clicking the Cancel button on the dialog that appears while holding down the CTRL, Shift and Alt keys. On Vista you can exit Explorer by opening the Start menu and right clicking in its client area (for example just right from the bottom half of your user icon) while holding down the CTRL and Shift keys: an Exit Explorer option will appear. After Setup has completed the upgrade start Task Manager (by hitting Ctrl+Shift+Esc) and select Run from the File menu, then type "explorer" and hit Enter. Usage should be straightforward. Right-click the Taskbar (or any other Explorer toolbar) and select Perfgraph from the Toolbars menu to start a new Perfgraph instance. Right-click a Perfgraph toolbar and select "New Perfgraph instance" from the menu that appears to add another graph to Explorer. To access the configuration screen, double-click any visible Perfgraph toolbar. Configuration settings are on a per-instance basis. Changing any of the options for a graph will not affect other instances. Microsoft disabled dragging toolbars from the Taskbar to the desktop on Vista, but you can still achieve the same result with a bit of trickery: first, create an empty folder on your desktop. Drag this folder to the very ednge of your screen. It will turn into a toolbar, and right-clicking it will allow you to call up Perfgraph from the Toolbars menu. Once Perfgraph is visible, right-click it and uncheck "New Folder" (or whatever your folder was called) in the Toolbars menu. You can then freely drag the Perfgraph-only toolbar around the screen. Note that to undock a toolbar from the edge of the screen on Vista, you can't just grab it anywhere in its nonclient area, you need to move your mouse to the very edge of the screen to be able to start the drag operation. To move a graph to the desktop, you can simply drag it from the taskbar if you're using Windows XP. If you then leave the graph in the middle of the screen it will turn into a floating toolbar. If you drag it to any edge of the screen, it will dock itself. If you have trouble resizing or dragging Perfgraph, make sure the "Lock the Taskbar" option is not selected in the Taskbar context menu. The dialog allows you to change what is being monitored, how frequently the graph is updated, what colors are used, and it also provides a number of target-specific options. Perfgraph will use Explorer's built-in serialization features, which means that your settings and graph layouts are only saved when you close Explorer cleanly, for example by logging off.